Douglas Laing announced Big Peat’s Limited Edition for Feis Ile 2019, Islay’s Annual Festival of Malt and Music. 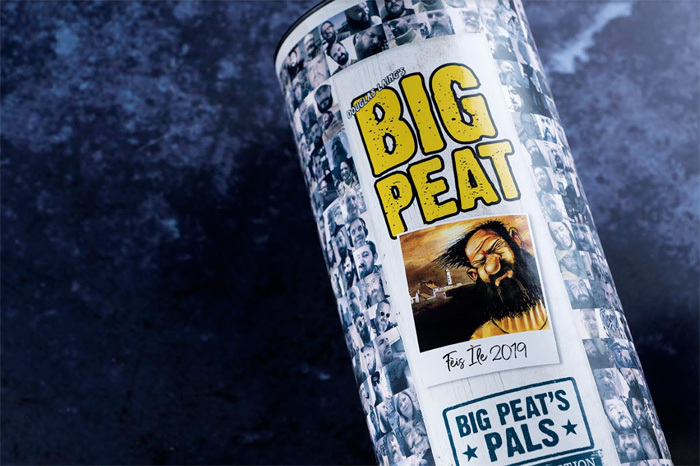 The packaging for the commemorative bottling features the faces of 400 of Big Peat’s ‘pals’ from all over the world, after fans of the brand were invited to submit their selfies via an online competition. The spirit within is a unique batch of the cult Islay Whisky, carrying a marriage of Single Malts distilled at Ardbeg, Bowmore, Caol Ila and even the long-closed Port Ellen distillery, amongst others. 2019 marks 10 years since the launch of Big Peat, and the Douglas Laing team plan to celebrate with an online birthday party themed tasting. Hosted on Big Peat’s Facebook profile during the Feis Ile Festival in late May, selected members of the community will be invited to join a virtual masterclass and enjoy samples of the classic Big Peat recipe, the new Feis Ile release, his recent 10 Years Old Limited Edition, and the oldest ever bottling released to date, the 26 Years Old Platinum Edition. Big Peat’s Pals Feis Ile 2019 Limited Edition is not chill filtered, offered without colouring, and bottled at high alcohol strength of 48%. Just 3300 bottles will be available globally. Further details of Big Peat’s online birthday party will be announced on his Facebook page.